Although not constituting a new album from T x R x P, this is a welcomed vinyl reissue of their debut cassette from 2008. As the tape was issued in an almost unobtainable run of 75 copies it is a positive to be given the opportunity to obtain an insight into the early works of this project via this re-release. 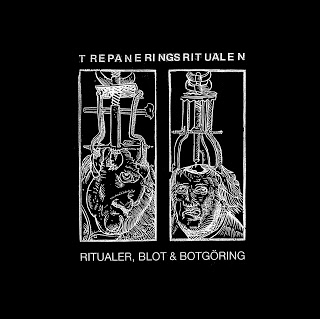 From the commencement of the first track it is clearly evident that the sound of ‘Ritualer, Blot & Botgöring’ differs from the more composed and occult / ritualised sound of recent material. Rather the sound presented here is of the lo-fi murky death industrial type, which draws parallels and comparisons with the more ambient works of Brighter Death Now. As such the prevalent atmosphere could be hyperbolically described as ‘the creeping dread of the unknown’, or ‘the rising horror of what might be lurking in the basement’. ‘Bloodletting Ritual’ opens the album and delivers a cavernous echoed undercurrent offset with gritty, lo-fi grinding textures. ‘Black Heaven/ White Hell’ follows with a sporadic knocking percussive element coupled with mid to high pitched noise squeals, before settling into a grinding bass loaded furrow (…the track bleeding out over an extended 13+ minutes). ‘Knife Play’ opens the second side and is slightly more animated with its bass percussive pulse again being partially buried by echoed lo-fi muck, before falling away into a muffled ambient segment with occasional rasping vocalisations. Alternately ‘Bestraffning & Beloning’ is one of the more composed tracks of the album, with a slow pounding beat and oscillating noise frequencies providing the death industrial rhythm, and is one of the main contenders for the aforementioned Brighter Death Now compassion. With the overall presentation, the design of the predominantly black LP sleeve is simple and classy, adorned with images of trephination (both medieval woodcuts and photographic examples). Noting that this was issued with a print run of a mere 250 it is anticipated that copies won’t hang around for too long. This entry was posted in 2012, death industrial, Strömkarlen, Verlautbarung by noisereceptor. Bookmark the permalink.